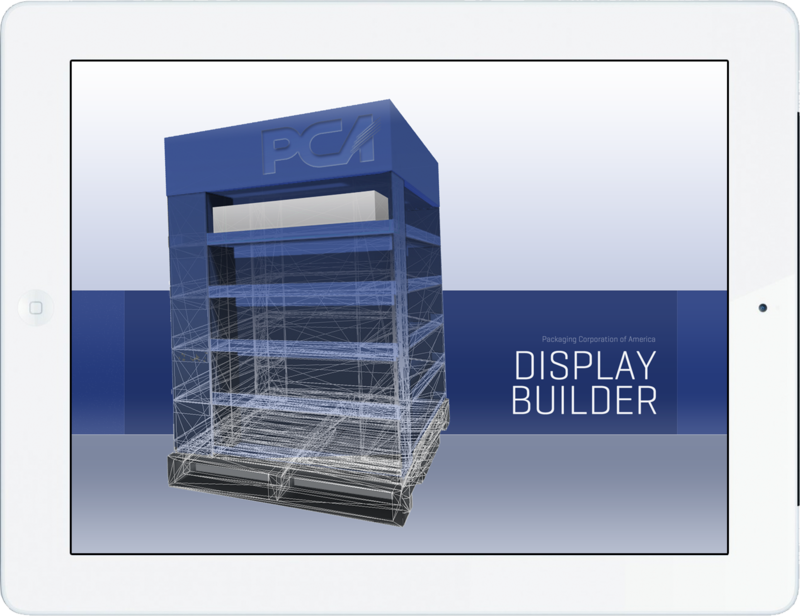 Display Builder is a Cousins and Sears solution created for Packaging Corporation of America (PCA), a publicly-traded company (as 'PKG') with one of the largest cardboard box manufacturing operations in the U.S. Among PCA's major product offerings are a line of cardboard displays used by most of the retailers in North America. These are the free-standing shelves seen in almost every large retail store positioned at the end of aisles holding chocolate, make up, school supplies or other products. PCA was looking for a way to use the iPad to allow their customers -- manufactures of products like candy, pet food, beauty products and so on -- to visualize and customize displays during on-site sales pitches at retail locations. The users of the app could also immediately calculate the cost of the customized display based on quantity and availability using real-time data from the product manufacturer. 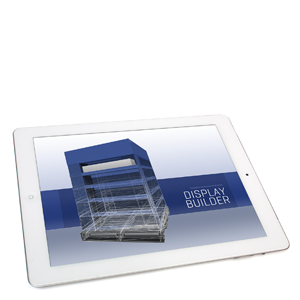 Want your own Display Builder? Contact us! 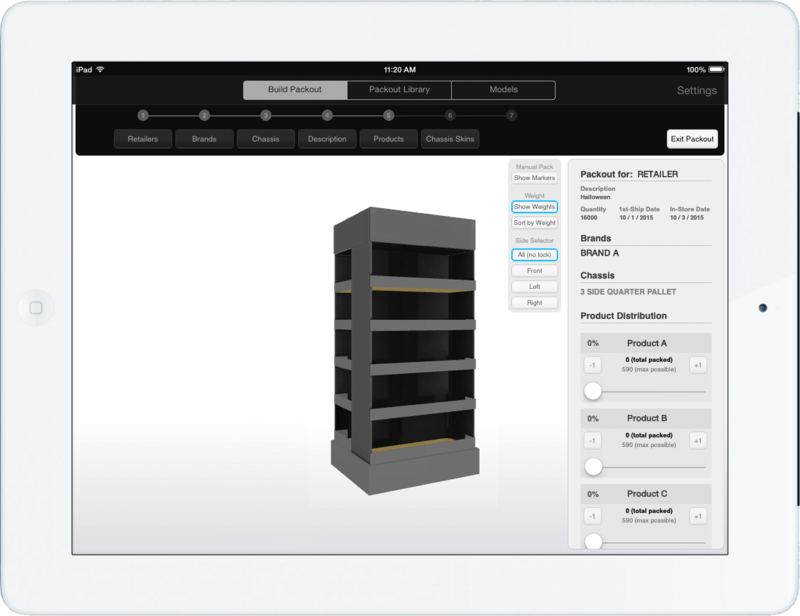 The application allows users to browse 3D examples of displays like a traditional catalogue, but the primary function of the app is to allow users to fill displays with products arranged in a custom configuration, to find out what that configuration costs, and to deliver a plant-approved sales memo with those details on the spot. Below are a few highlights of core functionality. The image below is of the main interface used for making a custom display. A series of controls along the top walk a user through the various steps, accounting for various dependencies along the way such as filtering product options based on retailer. To the right side of the interface are controls for adding products and readouts for feedback about the process. Products are rapidly added to shelves in the display by increasing the slider for a product on the right. Our packing algorithm makes sure that items are placed only in those locations where they’ll fit. Shelves on the display can be modified by hand. For example, users are able to slide products around or remove them entirely by just swiping or dragging them. Also, product manufacturers are allowed to specify how much a product can be compressed, like a bag of candy, so users are able to stuff more into the shelve thus creating more real world conditions (and more product!). All of these by-hand details are preserved with the sales memo on the back end, so the document also becomes an assembly blueprint back at the product manufacturing level. Users are able to toggle and compare their packing with various other arrangements of the same products in the same amount so they can easily understand if a display is top heavy. 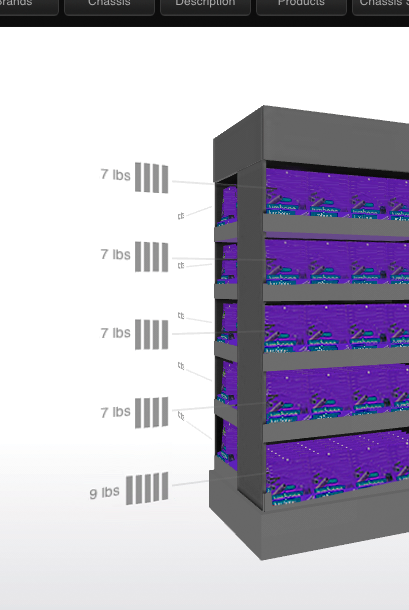 To help users understand that distribution, weight data is visualized by shelf, as seen in each of these screen shots (zoomed in for the image below). Content for the front end experience such as 3D models of displays and products are added to the system through a CMS. Designers simply upload a raw model and the system automatically analyzes the item for how it fits in displays or what the display. With respect to general technical underpinnings, the stack for this product consists of traditional tools including Rails, Linux, iOS with OpenGLES and a proprietary 3D engine and other components. Contact us for a full demo.